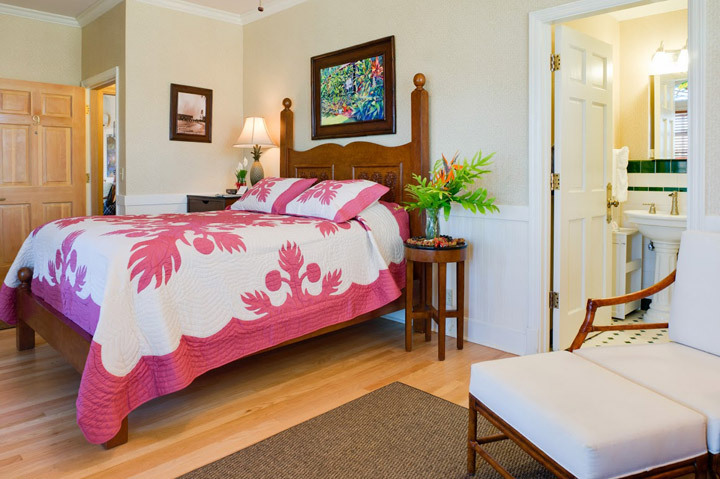 Located in Maui’s historic epicenter of Lahaina, The Plantation Inn is just steps away from the Pacific Ocean and all its exciting pastimes, yet its atmosphere of idyllic tranquility offers more than enough peace and quiet for those seeking some much needed R&R. Equipped with 18 comfortable rooms and suites, The Plantation Inn is a Bed and Breakfast uniquely decorated with a style that exudes lovely and simple turn-of-the-century charm. Surrounded by pristine, manicured gardens, guests may look forward to munching on the inn’s daily breakfast feast consisting of gourmet French Toast, Croque Monsieur, Eggs Florentine, Mueslix with homemade yogurt, bagels with salmon & cream cheese, fresh fruit, tropical juice and Kona coffee.